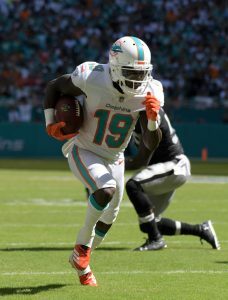 Dolphins wideout Jakeem Grant will be placed on injured reserve after suffering an Achilles injury in Week 10, according to Armando Salguero of the Miami Herald. Grant didn’t suffer a ruptured Achilles, which would have required him to undergo a comprehensive operation that could have knocked him out for 10-12 months, per Salguero. Instead, Grant underwent a separate, less-invasive procedure which should allow him to return for 2019 training camp. Grant, 26, took on a larger role in Week 8 due to injuries on the Dolphins’ receiver depth chart, managing eight targets while Kenny Stills and Albert Wilson were sidelined. Stills is now back in the fold, but Wilson has since been placed on injured reserve. Miami still has other options at the receiver position, however, including Danny Amendola, DeVante Parker, Leonte Carroo, and the recently-signed Brice Butler. While Grant wasn’t a key player on offense, his loss will be strongly felt on special teams, where Grant was Miami’s No. 1 kick and punt returner. Grant had managed 16.3 yards per punt and 29.7 yards per return this season, both of which are among the best figures in the NFL. Additionally, Football Outsiders ranks the Dolphins’ punt return unit as the league’s second-most efficient, while the club is fourth in FO’s kick return metrics. The Dolphins lost another game in Week 16 and now sit on the brink of getting a top 10 pick in the 2018 NFL Draft. However, the best players in this class do not line up very well with the needs of the organization, opines Barry Jackson of the Miami Herald. Jackson proclaims that if Miami loses to a playoff contending Bills team this coming Sunday, the team won’t necessarily have a clear player they are targeting in that range of the draft. According to Jackson, the team’s two biggest needs are linebacker and tight end, but no prospect is available at those positions who would warrant that type of draft slot. Jackson notes that the team could potentially go with Texas offensive tackle Connor Williams should the front office move on from right tackle Ja’Wuan James, but that’s far from a certainty. LSU pass rusher Arden Key could also be useful weapon on the defensive side of the ball, but there’s not a true need in that area either. Jackson speculates that Georgia linebacker Roquan Smith could be a fit if he can help increase his stock with a successful draft preparation process. Finally, the writer also throws cold water on the idea of replacing Ryan Tannehill because of the Dolphins substantial financial investment in him, even though he will be returning from a knee injury he suffered this past training camp . It would seem that while the Dolphins have been losing enough to move up the draft board, trading down may be the best option because of the lack of a fit in the upper portion of the draft. Even after trading Jay Ajayi, running back does not seem like a major area of need for the Dolphins entering the offseason. Second-year tailback Kenyan Drake has shined with Ajayi gone and Damien Williams recovering from injury. He played all but three snaps in the team’s loss to the Chiefs in Week 16 and ranks fourth among all running backs with 369 yards after contact. The 23-year-old has averaged over 4.5 yards per carry over his last four contests, and has made a difference in the passing game as well. With his productive late season performance, he seems primed to enter 2018 as the Dolphins surefire number one back. Wide receiver Jakeem Grant often gets lost in the shuffle behind the likes of Jarvis Landry, Kenny Stills and DeVante Parker. However, the second-year wideout managed to catch four balls for over 100 yards in last Sunday’s matchup. He’s only played in 10.4% of the team’s snaps this season, which makes sense because of the Dolphins deep receiving corps. But, Landry is set to hit the open market this offseason, so Grant could be auditioning for a bigger role in 2018 should the team’s star wideout move on. Grant wasn’t the only little used player to get increased reps in Week 16. Miami saw two new faces get a lot of action vs. the Chiefs as well. Tight end A.J. Derby, whom the team claimed from the Broncos, was targeted five times. Although, he only managed one catch in the contest. Cornerback Torry McTyer played in 61 of the defense’s 83 snaps before he was taken out of the game due to injury. McTyer was signed by the Dolphins as an undrafted free agent last offseason and could be in-line for a further audition in Week 17 should he be heathy enough to play. Miami needs more tight ends and defensive backs for next season, so Derby and McTyer could get another shot to impress in the team’s regular season finale this weekend. Malcolm Butler reported to the Patriots earlier this week to participate in voluntary workouts, but as Ryan Hannble of WEEI.com writes, that does not mean he is happy to be back in New England. Butler has been displeased since the club signed Stephon Gilmore to a five-year, $65MM deal this offseason, and while the Saints were apparently willing to pony up big bucks for Butler, they were unwilling to also part with their No. 11 overall draft pick for his services. But with Gilmore set to assume the No. 1 cornerback role in New England, Butler may be shifted to the slot, which could decrease his value when he hits unrestricted free agency next year. Hannable says that the situation is worth monitoring because if Butler isn’t playing the way he wants, and if that creates a locker room distraction, the Pats could still trade him, just as they traded Jamie Collins last year. Jakeem Grant, who worked almost exclusively as a return man for the Dolphins last year, is being asked to learn the outside receiver positions this offseason, as Barry Jackson of the Miami Herald writes. Grant played only 19 offensive snaps last season, and he dropped the only pass thrown his way, but offensive coordinator Clyde Christensen believes his explosiveness will translate well to offense. There are a few ways the Redskins go could about re-organizing their front office, which John Keim of ESPN.com helpfully summarizes in his latest mailbag. Keim believes the club will really start working on the issue over the next week or so, which will include interviewing potential GM candidates. Nate Gerry was a safety during his collegiate career at Nebraska, but as Zach Berman of the Philadelphia Inquirer writes, the Eagles plan to convert Gerry, whom they selected in the fifth round of this year’s draft, to linebacker. Gerry will have a chance to compete for immediate playing time in an unsettled linebacker unit. We learned yesterday that Giants wide receiver Brandon Marshall plans to hang up the cleats after his two-year deal with Big Blue expires at the end of the 2018 season (as long as he has a Super Bowl ring by then). Fullback Dan Vitale signed his deal with the Buccaneers, GM Jason Licht tweets. Selected in the sixth round (No. 197 overall) and with the Bucs’ final pick, Vitale made his mark as a ball-carrier in the passing game. The Northwestern blocking back accumulated 135 receptions for 1,427 receiving yards with the Wildcats from 2012-15. He only received six carries in college. The Dolphins signed sixth-round selections Jakeem Grant and Jordan Lucas, Adam Beasley of the Miami Herald reports (on Twitter). Miami traded up to No. 186 to take Grant, one of the best slot receivers in the draft despite standing 5-foot-7, and took Lucas — a defensive back from Penn State who’s seen time at both corner and safety with the Nittany Lions — at No. 204. The Bengals made their first draft pick signing of the year by agreeing to terms with wide receiver Cody Core, whom they chose in the sixth round (No. 199 overall), Coley Harvey of ESPN.com tweets. Core’s deal will be for approximately $2.4MM and including a $127K signing bonus, Jim Owczarski of the Cincinnati Enquirer reports. The Jaguars have signed defensive end Jonathan Woodard, reports John Oehser of Jaguars.com (via Twitter). The seventh-round pick owns the career sack record (30.5) at Central Arkansas. Woodard was one of three defensive ends to be selected by the Jaguars, joining Yannick Ngakoue (Maryland) and Tyrone Holmes (Montana). The Dolphins’ infatuations with multiple receivers caused the No. 186 pick to be exchanged twice in two days. Miami reacquired the sixth-round selection from Minnesota in order to take elusive Texas Tech slot receiver Jakeem Grant, doing so a day after sending it to the Vikings on Friday night in trading up to take Rutgers target Leonte Carroo at No. 86. The Dolphins sent a seventh-round pick — No. 227 — to the Vikings in order to move up again to take a wideout, Ben Goessling of ESPN.com reports (on Twitter). The Vikings then re-traded the Dolphins’ No. 196 choice with the Eagles to No. 188. A 5-foot-7 target who led Division I-FBS in yards after catch in 2015, Grant broke out for a 1,268-yard, 10-touchdown season for the spread-reliant Red Raiders as a senior. At 168 pounds, Grant profiles as a player who can help the Dolphins out as a return man as well. He and Carroo add to a receiving corps that lost Rishard Matthews and, to a lesser extent, Greg Jennings, in the offseason but returns Jarvis Landry, DeVante Parker and Kenny Stills. Cardinals wide receiver Larry Fitzgerald is entering the final year of his contract with the team, but he says he hasn’t given much thought to his future beyond 2016, as Adam Green of ArizonaSports.com details. Although it seems unlikely that Fitzgerald would contemplate retirement in the near future if he keeps performing at the level that he did in 2015, he suggested that his future will likely be linked to the Cardinals’ quarterback situation. The Falcons have yet to officially exercise the fifth-year option for cornerback Desmond Trufant, but that’s essentially a formality, writes Vaughn McClure of ESPN.com. The Pro Bowl corner intends to remain in Atlanta “for a long time,” as he tells McClure. Trufant is one of more than 20 players whose teams haven’t yet announced decisions on their options for 2017, as our tracker shows. The Cardinals, the Bears, and Washington were among the teams to host Western Kentucky QB Brandon Doughty for pre-draft visits, according to Rand Getlin of the NFL Network (via Twitter). Doughty also participated in the Dolphins’ local workout day earlier this month. After meeting with Miami earlier this week, Texas Tech wide receiver Jakeem Grant visited the Cardinals on Tuesday and is making his final visit today to Chicago to meet with the Bears, tweets Rand Getlin. Iowa State wide receiver Quenton Bundrage privately worked out for the Buccaneers, a league source tells Aaron Wilson of the National Football Post. Bundrage tore his ACL in 2014, but bounced back in 2015 to catch 41 balls for 548 yards and four touchdowns. The Steelers have used the majority of their pre-draft visits within the last week, and announced several more today. As Jeremy Fowler of ESPN.com writes, the following players were in Pittsburgh today to meet with the club: Ole Miss defensive lineman Robert Nkemdiche, Alabama cornerback Cyrus Jones, West Virginia safety Karl Joseph, South Carolina wide receiver Pharoh Cooper, Virginia Tech linebacker Dadi Nicolas, Colorado cornerback Ken Crawley, Maryland safety Sean Davis, and Boston College safety Justin Simmons. Arkansas running back Jonathan Williams is visiting with the Patriots at Gillette Stadium today, sources tell Jeff Howe of the Boston Herald (on Twitter). The Pats previously met with the tailback at the combine. Williams, 22, missed the 2015 regular season after undergoing foot surgery. In 2014, he racked up 1,190 yards and 12 touchdowns on the ground despite splitting carries. Patriots defensive lineman Dominique Easley has hired agents Drew Rosenhaus and Michael Katz of Rosenhaus Sports for representation, as Rand Getlin of NFL.com tweets. Easley, 23, has been plagued by injuries since being selected by the Patriots in the first round of the 2014 NFL draft. In December of last season, he was placed on IR with a leg injury. In his injury-shortened sophomore year, Easley totaled 15 tackles and two sacks as a part-time player. Texas Tech’s Jakeem Grant is visiting the Texans, as Aaron Wilson of The Houston Chronicle writes. The wide receiver/kick returner has also worked out for the Dolphins, Colts, and Jets. Grant returned four kicks for touchdowns over the course of his collegiate career with the Red Raiders and caught 90 passes for 1,268 yards and 10 touchdowns last season.